This album is a mixture of an album Phil released in 1990 called Southern Cross and a live recording from the Guitar Legends Festival in Seville in 1993. In 1989 Phil was ready to start work on another album and realised that he had never explored his Latin heritage. - childhood in Cuba, adolescence in Venezuela and Columbia. The lyrical and musical content of the songs on the album came from a desire to blend rock, pop and dance with Latin rhythms like Cumbia and Andean folk music. It started life as an instrumental album but Tim Finn of Split Enz and Crowded House fame turned up from Oz one morning and Southern Cross metamorphosed onto a series of musical collaborations. Tim helped Phil with lyrical thoughts and together, with help from a few friends they came up with what they thought was a new musical genre, Southern Cross. The original Southern Cross album was the first album to be released on Phil Manzanera's Expression label. The album consisting of 11 songs and 1 instrumental has its vocals featuring Gary Dyson, Ana Maria Valez and Tim Finn. A Million Reasons Why was released as a 7" with an extended version released on a 12". A remix of Tambor was released in Spain and Guantanamera was released as a 3" CD in Japan and had 3 mixes of the track released in Germany under the title Phil Manzanera Project. The UK vinyl version of Southern Cross omitted Blood Brother and Venceremos. A USA edition of this album was released in 1991. which omitted Astrud, Guantanamera & Blood Brother and added a new recording of Frontera '91. This is an instrumental version of the song from Phil's Diamond Head album. 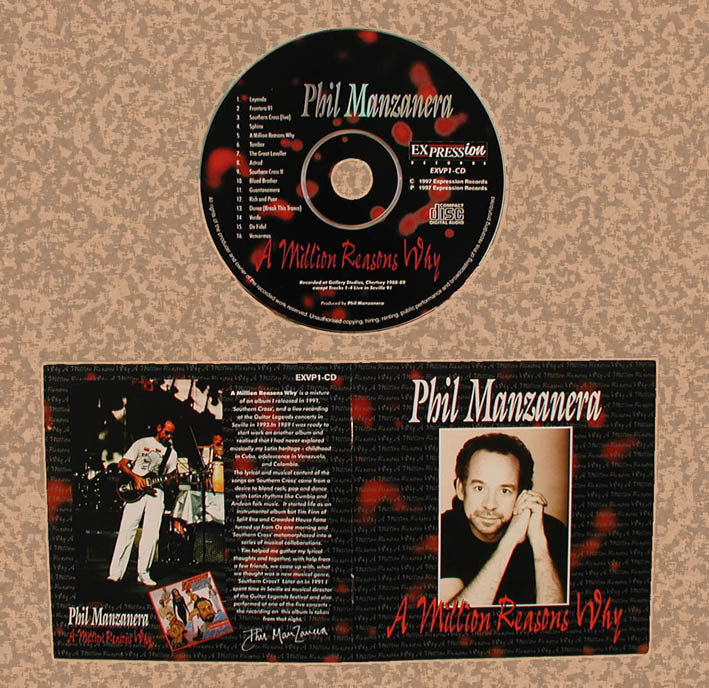 Phil Manzanera Guitars, Keyboards, Tiple' & Voice on A Million Reasons Why, Electric & Cello Guitar on Tambor, Guitar & Orchestral Guitar On The Great Leveller, Guitar On Astrud, Bass, Sax Guitar, Guitar & Guitar Synthesizer on Southern Cross, Guitar, Guitar Orquesrta, Guitar Bells on Blood Brother, Guitars & Tiple' On Guantanamera, Guitar, Bass, Drum Programming & Effects On Rich And Poor, Guitar, Tiple', Bass Drum Programming On Dance (Break This Trance), Guitar, Tiple' & Effects Guitar On Verde, Guitar, Keyboards, Drum Programming & Tiple' On Dr Fidel. Guitars On Venceremos. Keith Bessey Programming On A Million Reasons Why, Drum Programming On Tambor, Guantanamera & Dance (Break This Trance), Percussion Programming On Blood Brother. Suzie Webb Backing Vocals On A Million Reasons Why, The Great Leveller, Blood Brother, Rich And Poor, Dr. Fidel & Venceremos. Val Mckenna Backing Vocals On A Million Reasons Why, Tambor, Astrud, Blood Brother, Rich And Poor & Dr. Fidel. Tim Finn Backing Vocals On A Million Reasons Why, Lead Vocals On Rich And Poor, Dance (Break This Trance), Verde, Dr. Fidel & Piano On Venceremos. Bosco de Oliviera Rain Maker & Brazilian Percussion On A Million Reasons Why, Assorted Brazilian Percussion On Southern Cross, Congas & Brazilian Percussion On Rich And Poor. Gary Dyson Lead Vocals On A Million Reasons Why, Tambor, The Great Leveller, Blood Brother & Venceremos. Livingstone Brown Bass On Tambor, The Great Leveller, Blood Brother & Dr Fidel. Phil Todd Alto Sax On Tambor, Sax On The Great Leveller, Tenor Sax On Astrud, Sax On Guantanamera, Alto Sax On Rich And Poor, Sax On Dance (Break This Trance) & Verde. Chris Davis Alto Sax On Tambor, Sax On The Great Leveller, Sax On Guantanamera, Alto Sax On Dance (Break This Trance) & Sax On Verde. Guy Barker Trumpet Solo On Tambor, Trumpet On The Great Leveller, Rich And Poor & Verde. Sally Ann Triplett Backing Vocals On Tambor & Blood Brother. Lisandro Zapata Bass On The Great Leveller & Venceremos. Zoe Nicholas Backing Vocals On The Great Leveller, Verde & Venceremos. Mike Sturges Drums On Blood Brother, Verde & Venceremos. Billy Nicholls Backing Vocals On Guantanamera. Rebecca De Ruvo Backing Vocals On Dance (Break This Trance). John 'Trapper' Maile Additional Engineering.